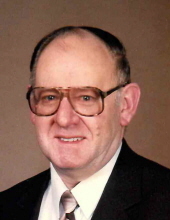 Elroy E. Bleuel, 85, of Fond du Lac, passed on Wednesday, January 23, 2019 at Woodlands Senior Park. He was born on May 12, 1933 to the late Charles and Antoinette (Koenigs) Bleuel in Fond du Lac. Elroy married Karen Woehlke on June 25th, 1966 at Sacred Heart Catholic Church in Fond du Lac. She preceded him in death on December 8, 2018. Elroy served with the United States Army for 4 years and was stationed in Germany. He learned how to drive through round-abouts there. He was ready for them to be built here. He worked for Mercury Marine for 41 years. After retiring, Elroy and Karen traveled worldwide together. They loved to go to Shawano with friends and gambling. He was a member of the Eagles Auxiliary Club. He loved his nieces and nephews like they were his own. He was preceded in death by his wife, Karen; his parents; one brother, Kenneth and two sisters-in-law.Survivors include: two brothers-in-law, Roger (Carol) Woehlke, Doug (Barb) Woehlke; eight nieces and nephews and spouses; and many great-nieces and nephews. Elroy’s family will receive relatives and friends on Thursday, January 31, 2019 from 9:00 AM to 10:45 AM at Zacherl Funeral Home, 875 E. Division Street in Fond du Lac. A Liturgy of the Word will be held at 11:00 AM. Entombment will take place at the Chapel of the Risen Christ, Calvary Mausoleum. In lieu of flowers, please direct donations to the Fond du Lac Fire Department Station #2 EMT’s. "Email Address" would like to share the life celebration of Elroy E Bleuel. Click on the "link" to go to share a favorite memory or leave a condolence message for the family.